Parish representatives have raised a formal complaint about the county council’s management of the highways through their village. The Parish Meeting of the Burton Pedwardine and Burton Gorse has made the matter official with Lincolnshire county Council and their local ward member, Coun Barry Young after previously raising concerns by residents that their country roads were getting worse, not better since the introduction of additional funds to tackle potholes. 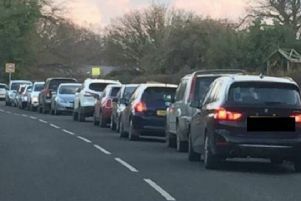 Chairman of the Parish Meeting Craig Wood says: “Matters have disintegrated (like our roads) to the extent that the County Council is now claiming to fix reported issues when no work of any kind has been carried out. “Furthermore, the Village Meeting will be voting on a motion of no confidence in the County Council at the next AGM. In particular he reported potholes across Helpringham Road but this defect was reported as ‘fixed’ on March 6, yet no work of any kind had been carried out. Another pothole at the junction with Heckington Road was reported ‘fixed’ on February 25 but again no work had been done; the pothole is full of water. He added that the road had been deteriorating due to increased heavy vehicle traffic from the biogas plant at Holdingham travelling to spread waste on fields as fertiliser. Mr Wood said complaints have been made about the glitches but they were “fobbed off” being told to report them again. He listed further examples as well. He said there were either failures in the administrative process where defects are being marked as fixed before this is the case (he suggested this could cynically look like ‘massaging the statistics’, or the council’s contractors were being paid for work not carried out. Mr Wood said: “What is the council spending its money on, because it is not on this part of the world? The roads concerned are getting to the point of becoming dangerous because they are subsiding so much. The two sides of the road are being pushed into the ditches and giving way, with a big hump in the middle.